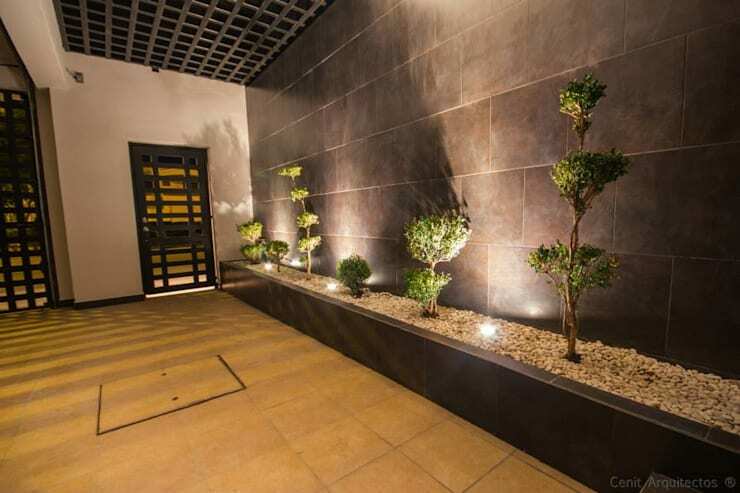 To beautify the entrance of your home nothing works better than a garden. 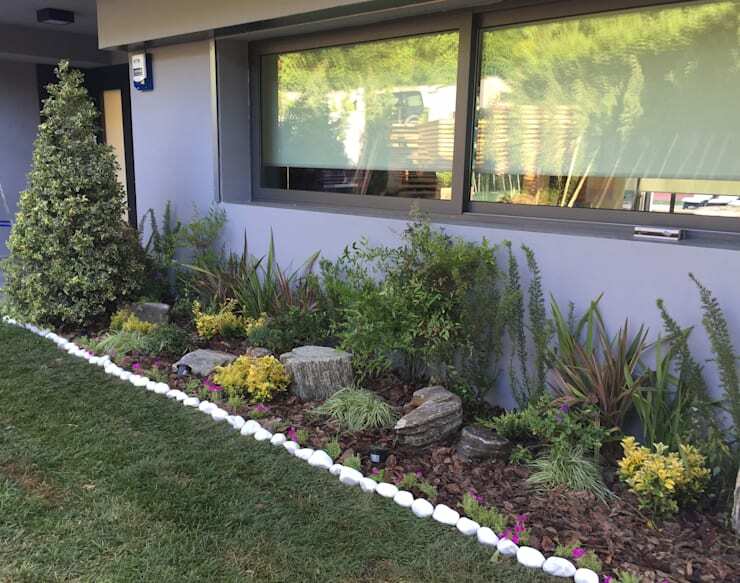 Things like fresh and colorful vegetation, harmonious designs, pots to match the style of the house, aromatic herbs, small trees, flowerpots, palm trees surrounded by flowering shrubs or coverings of tiny flowers of many colors are ideal for brightening the view. 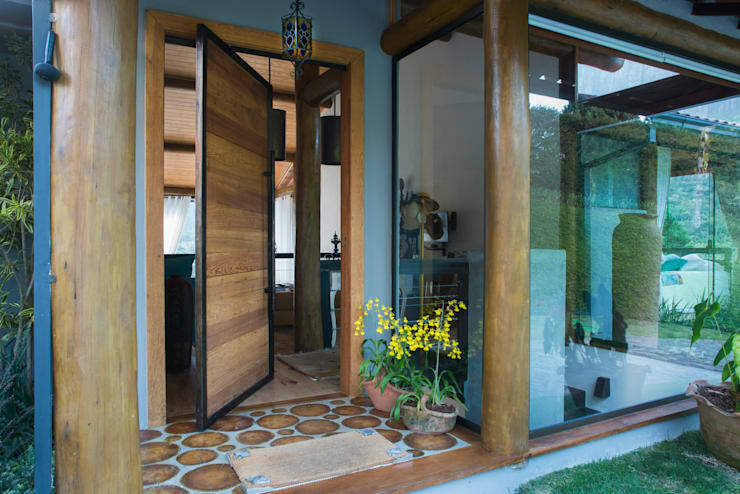 In this ideabook, we are going to show you 21 designs of gardens that can be made to at the entrance of your house or either in the courtyard before the threshold. If you do not have space for a garden, then do not forget that there are pots available. Look for designs of containers that go with the style of your home. You can plant some lilies, a little rosebush, lucky bamboo, a phone holding its branches up, some geraniums and hydrangeas as well. If you are a perfectionist, this design is for you. 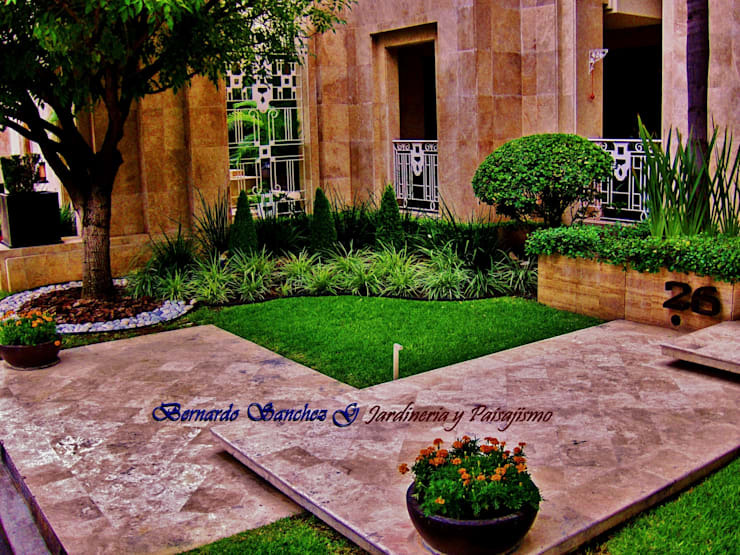 A garden correctly delimited in sections, with a grass area, a small stone fence, floor coverings in sections defining colors and behind them some shrubs. 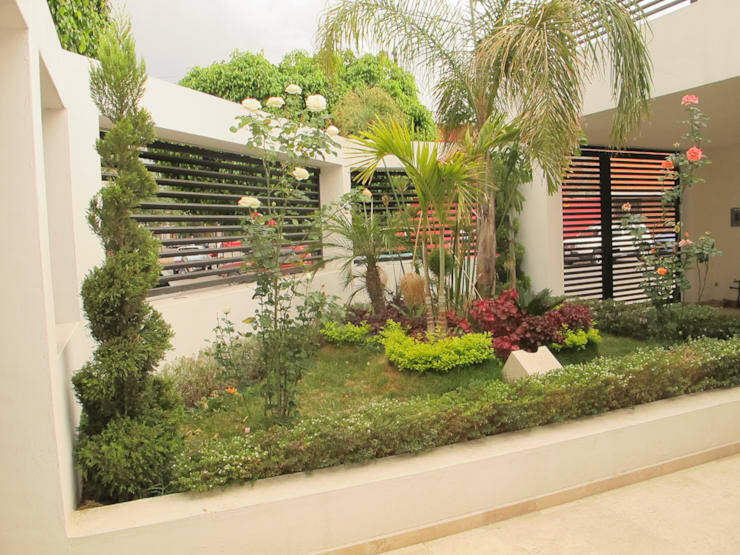 If between the entrance to your land and the main door of the house you have the opportunity to install a garden, do not hesitate. This will give life to your home along with color and freshness. 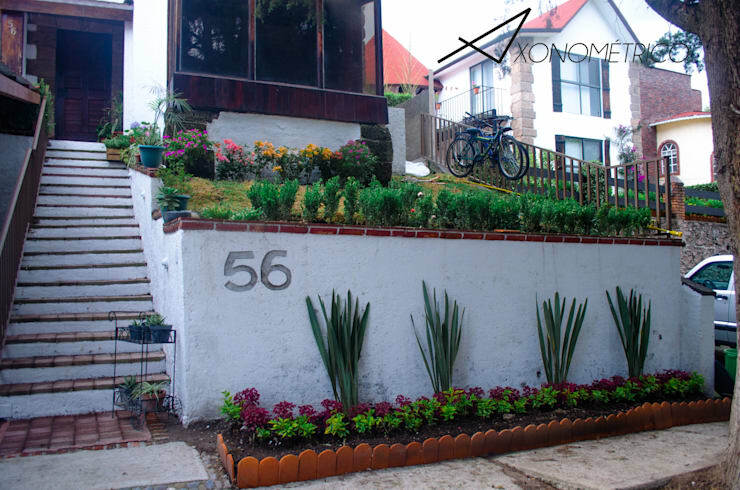 Having your house built on a higher level of the sidewalk does not mean you can not have your garden. On the contrary, you can generate platforms and vegetation levels, such as this facade. 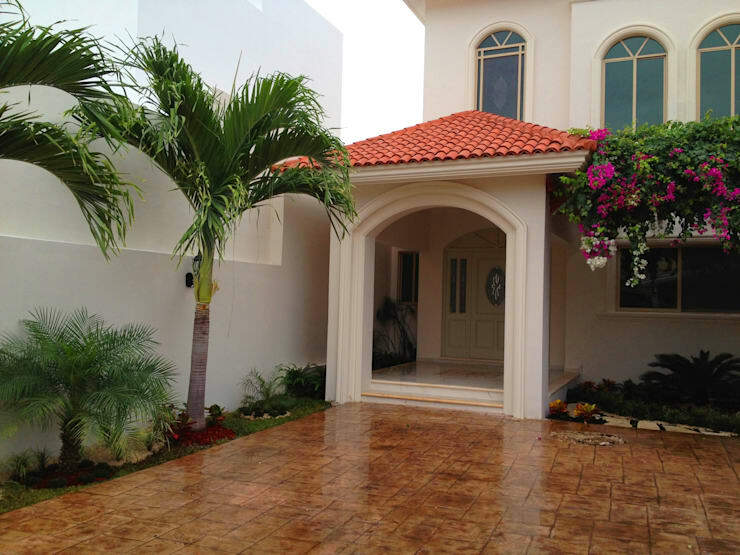 A discreet and beautiful garden can include a couple of Benjamins, a cypress, some palm trees, desert-like shrubs and a lot of colors. 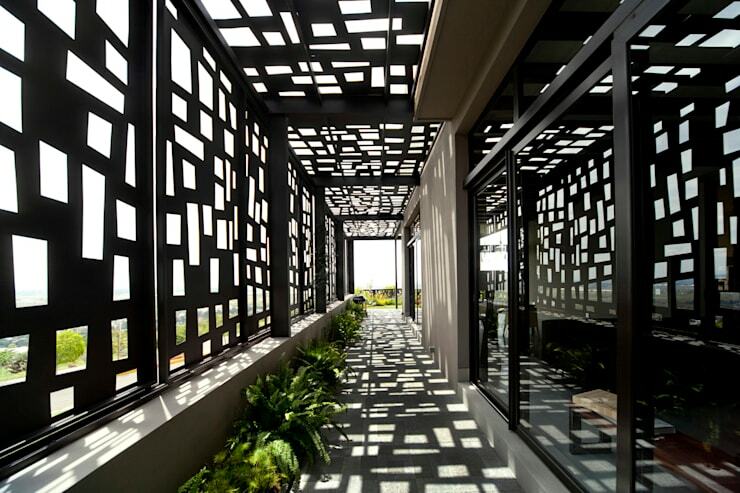 If it is placed in front of the window of the room, you can make both the places look good. If you have a large garden, do not cover all the area with ornamental plants. 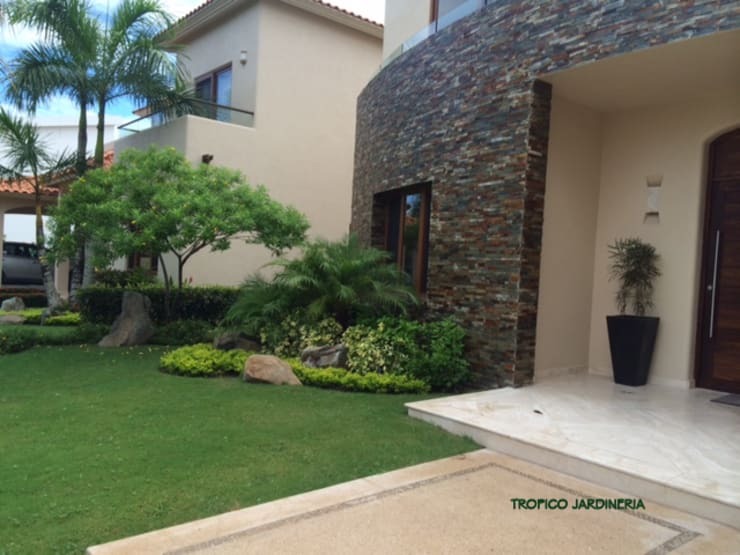 You can leave most of it covered in grass and accentuate an area using a discreet design of palm trees, bushes of different shades of green and some volcanic stones. An excellent garden on the way to the entrance of the house can include a pair of terrestrial lily pans or St. George swords. 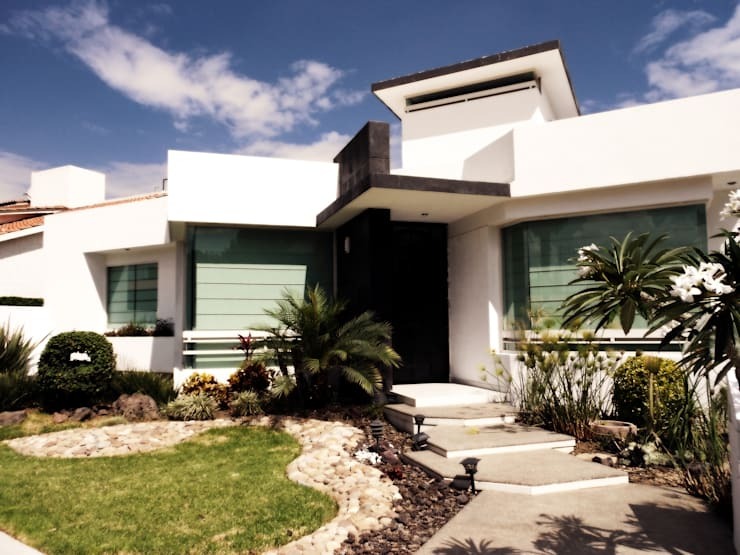 They can be protected in the front with some cover or colorful flower shrubs, such as sun brides, lavender or colored dogs. 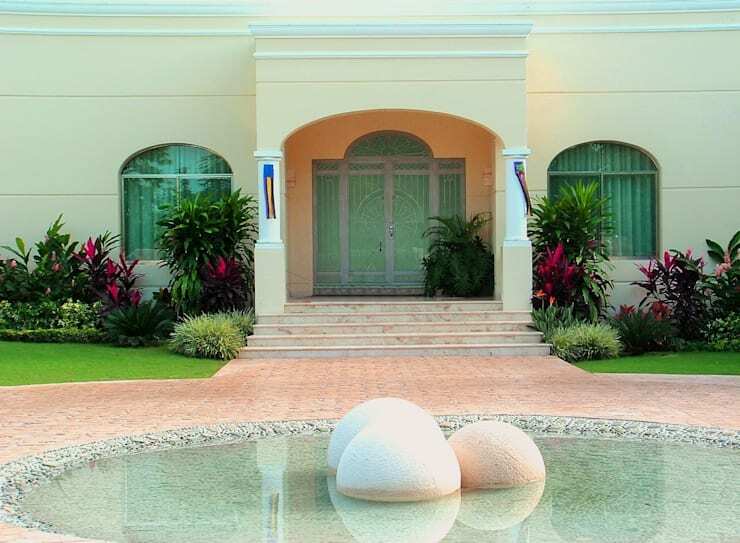 Using different types of stones and shrubs in the same place will allow you to create a dynamic landscape. It can also be adjusted according to the available area. Behind the door, a small garden can also look great. 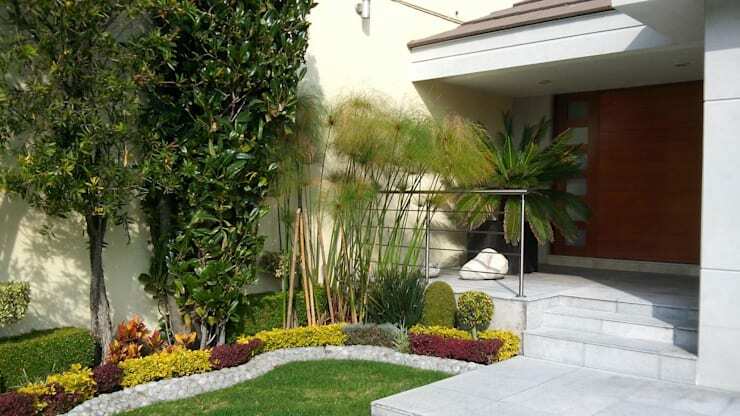 You can plant some espatifilos, dwarf palms, calatheas and dracaena within the area. The intensity of the green shades will beautify the place instantly. These bougainvilleas perfectly trimmed and accompanied by other shrubs, guard the threshold that leads us to the front door. They look majestic and at the same time discreet. It would be ideal for your home to use a route by platforms, so as not to concentrate steps in one place. 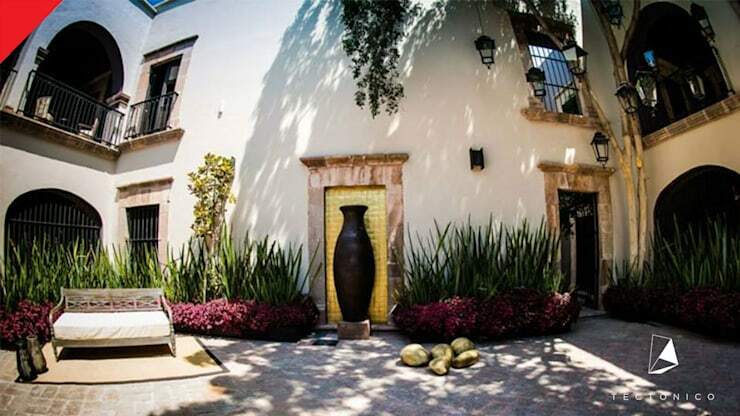 You can surround them with areas of grass, some sabilas, cypresses, and lilies. 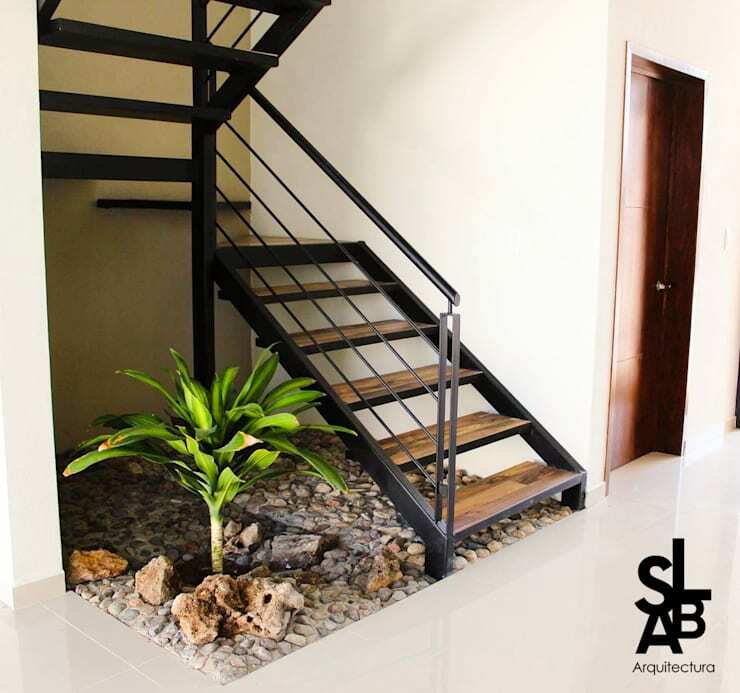 For the entrance to the interior, you can create a garden under the stairs or in the corner of the hall as well. Something like a dry stone garden and a palm tree, a set of bamboo or an elephant's foot would be ideal. 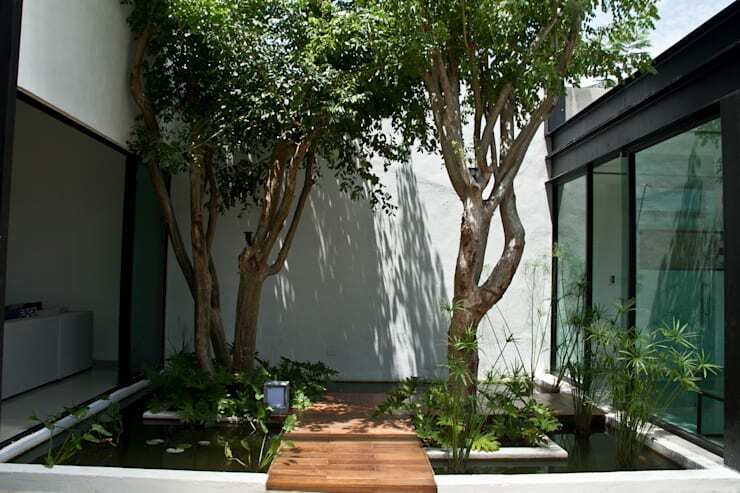 If you already have one or two large trees in front of the entrance, you can close your bowls and design a water feature. 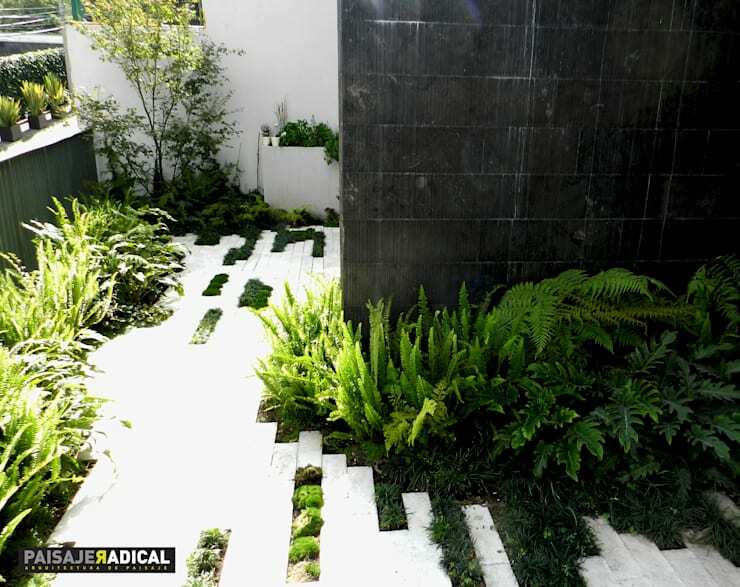 With a simple concrete structure and the necessary waterproofing on the ground, in addition to a pump to reuse water, you can place aquatic plants such as lilies, ferns around and even water lilies. 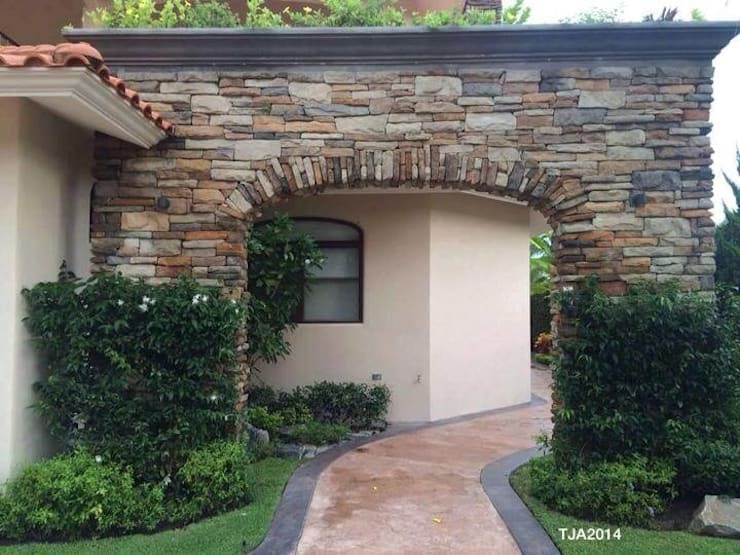 An excellent way to frame the porch is by placing plants of different levels, such as dwarf shrubs in the foreground, some palm trees, obelisks or tall shrubs with flowers and finally, some bamboos or palm trees close the frame. Something simple that also looks great is the ferns. They reflect freshness and vivid movements generated by the wind making them look incredible. If you do not have much space for a garden, then a side planter in the garage can change the atmosphere. 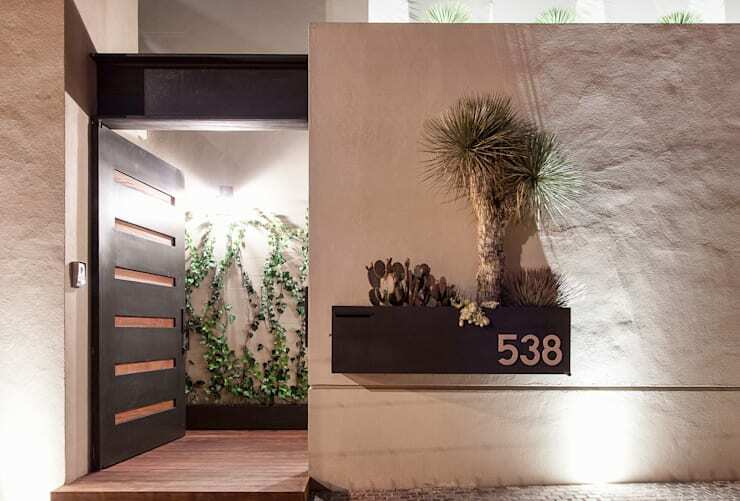 Try to build a linear planter with a covering that combines with the design of the space. A vertical garden is always good to enhance the trails. You can plant a climbing shrub such as ivy, bell, virgin vine, bougainvillea or honeysuckle. If the door of your house is far from the entrance to the land, do not let the journey be tedious and lonely. Delimits a linear or stepped zone along the road and places two types of floor coverings. You can also place a pot near the doorbell to make it look beautiful. The plants should be small and manageable. You can plant some succulents like a cactus or biznaga. 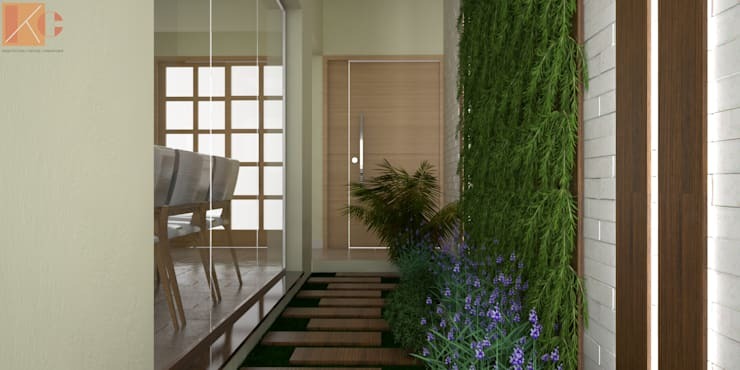 A simple design which is also discreet is creating a hallway with plants on one side. 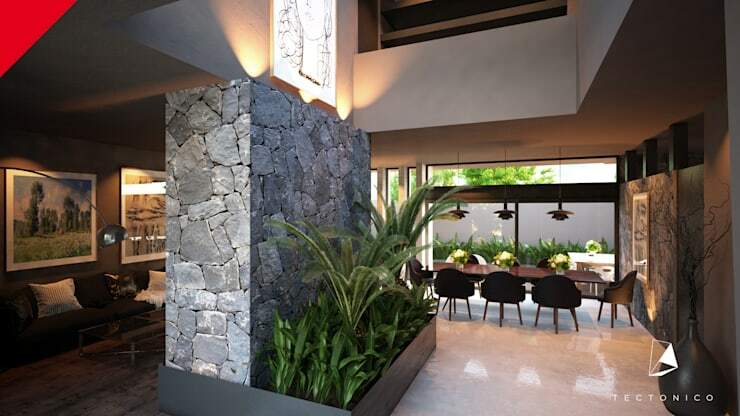 You can choose varieties like the ferns, monsteras, espatifilos or swords of San Jorge to frame the home. 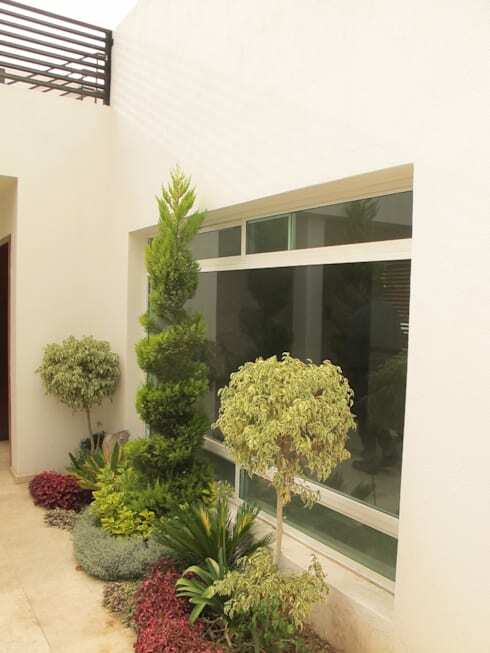 Are you planning a small garden outside the entrance of your house or inside, like a vertical garden?